A Raspberry Pi Arduino board? That’s right! If you’ve ever dreamed about a device that could include the best features of both of these devices – well you may have just stumbled across your next purchase! 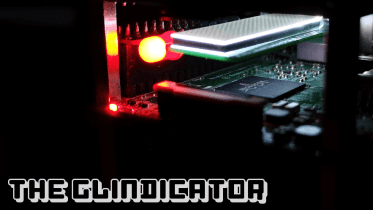 Alex Eames from RasPi.TV has sent me a preview version of his upcoming RasPiO Duino board, which adds an Arduino chip to your Raspberry Pi via the GPIO – and lets the two boards talk to each other. Yep – you can write programmes that use both of the devices at once! 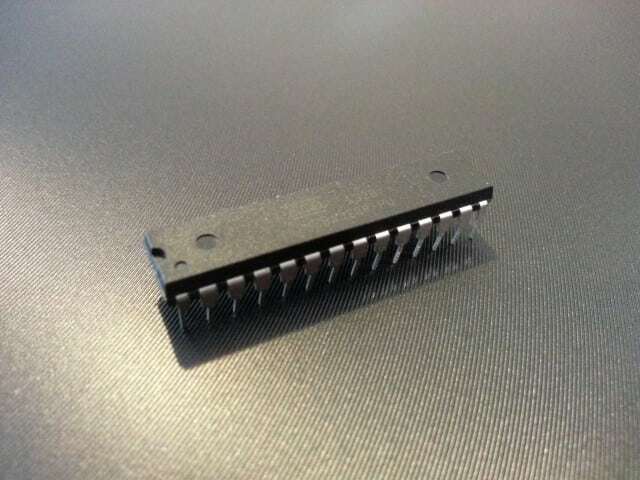 Now I’m new to Arduino – really new. In fact, this board is the first time I’ve even seen an ATmega chip. 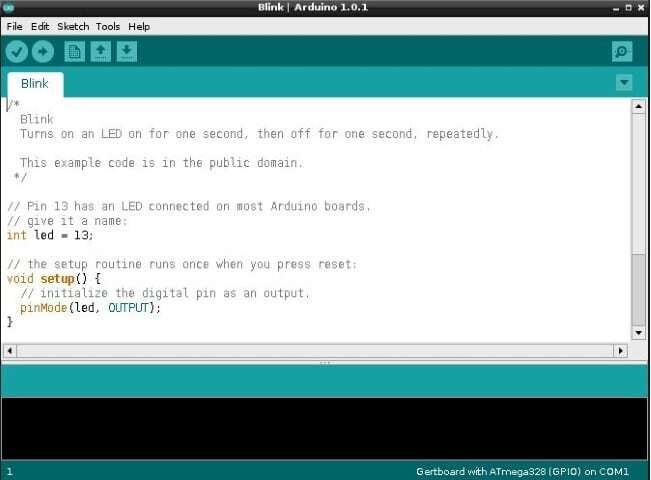 I was keen on trying out Alex’s design as I wanted to see if you can use something like this to learn Arduino, rather than buying a dedicated board such as the Arduino Uno. Having no prior experience with Arduino, this was my first question. It’s a natural reaction if you haven’t used an Arduino before as, like me, you won’t understand the differences and unique benefits of the Raspberry Pi and Arduino boards. 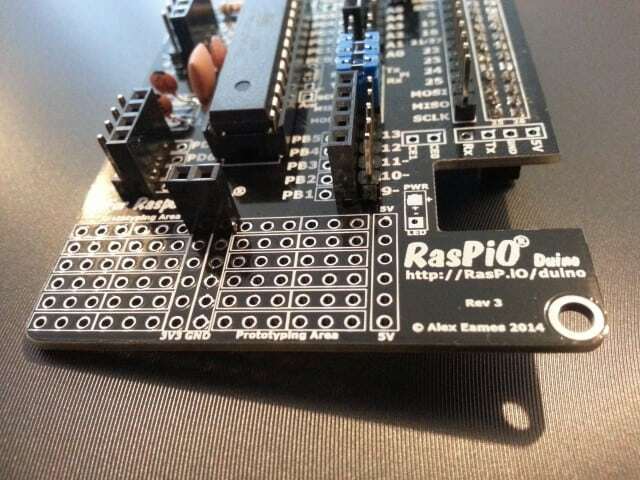 To make this little collaboration of devices a lot easier for us regular folk to get involved with, Alex Eames has designed the RasPiO Duino. 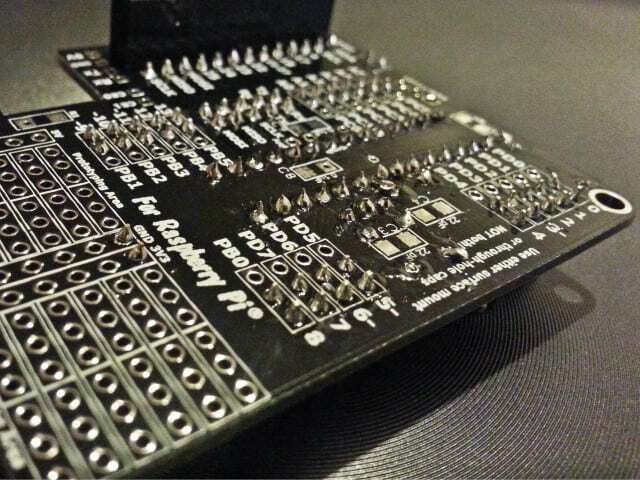 It’s an add-on board for the Raspberry Pi that includes an ATmega328 chip – the same thing popular Arduino boards use. 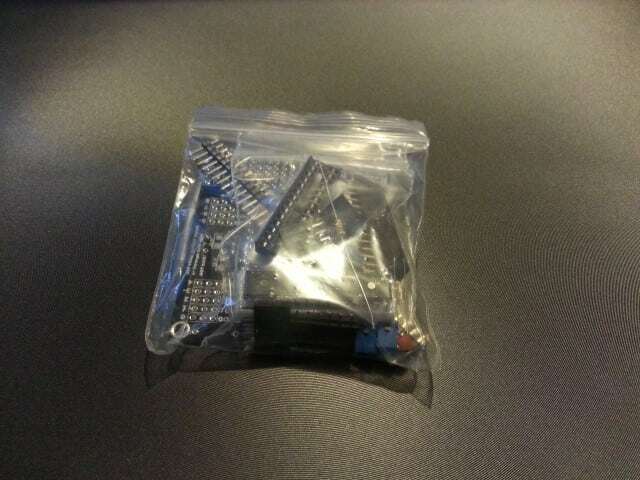 The RasPiO Duino comes in kit form for you to have some fun with initially. So even if your coding is terrible, at least you had a giggle building it right? 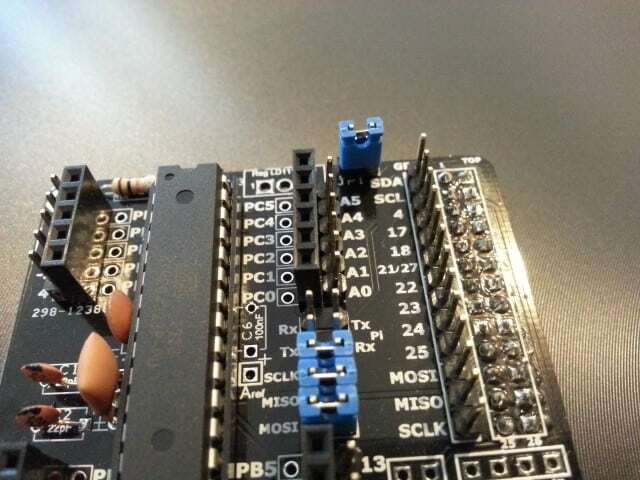 I’m a fan of kit-form add-on boards – I find it very rewarding looking at a finished board soldered using your own hands. 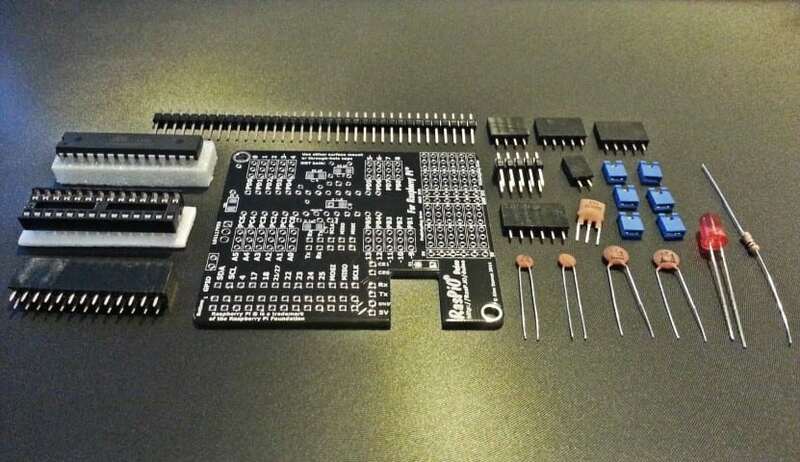 Clearly the main feature here is the ATmega328 that gives us that Arduino goodness that we crave, however Alex gave some good thought to the rest of his board for practical use. All of the relevant pins from both the Raspberry Pi and ATmega chip are broken out – three times in fact! The PCB has space for the included female and male headers, and also leaves you with additional pads for direct soldering (or more headers). Speaking of voltage regulators – there’s a dedicated section for one to be added, and Alex even recommends the right type to use if you need one for your project. Another smart feature is the optional SMT pads that can be found lurking in various areas of the PCB. If you’re up for the intricate soldering, you can add surface mount LEDs, resistors and capacitors to make a really smart looking board. I have to be honest here and admit that I left this kit in my ‘to do’ box for a while, as I really didn’t think I’d have the know-how to set it up, let alone write code for it. However – after a couple of decent ales after work one chilly Wednesday evening, I arrived home with a newfound courage and enthusiasm to give it a go. It was actually very easy – foolproof even. Alex provided me with a set up guide video (not public just yet) which takes you through the process step-by-step. Within 10 minutes of running various ‘wgets’, ‘sudo installs’ and ‘chmods’ – I had the board up and running, ready to code in the Raspberry Pi Arduino IDE. The lesson here – don’t make assumptions! Once you have the board soldered and software set up, it’s time to go into the Pi’s desktop and use the IDE to send a ‘sketch’ to the RasPiO Duino. Sounds confusing again doesn’t it? Let me explain. 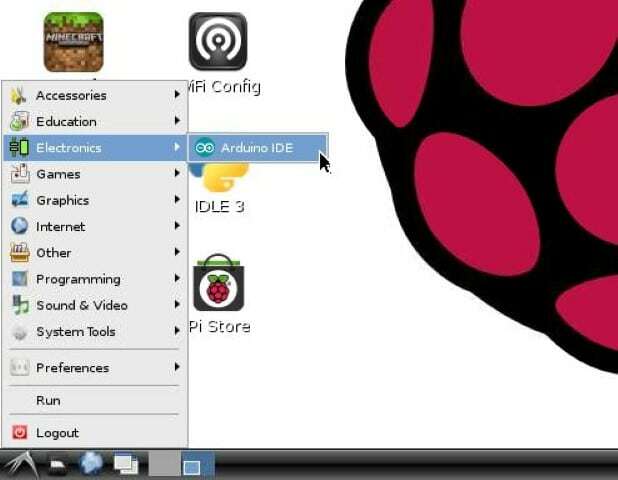 The IDE stands for ‘Integrated Development Environment’ and is the tool you use to write code and then send that code to the Arduino. With a normal Arduino board you would have to plug it into the USB port on your PC to send the code over, but with the RasPiO Duino it’s all done via GPIO. 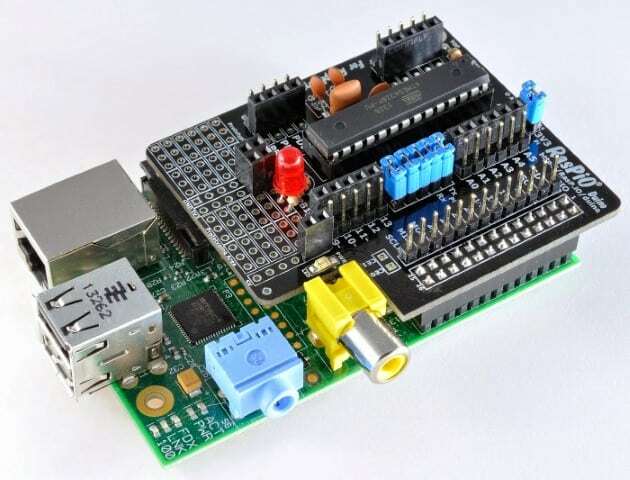 That may seem a bit odd if you’re used to the Raspberry Pi where we can code directly to the board itself (using nano) and/or use network tools such as SSH or VNC to transfer Python files – but that’s just another difference between the boards. The code for Arudino is also based on C/C++ – which I believe can also be used on the Pi – but any amateur like myself will have probably only come across Python on the Pi so far. Luckily Alex’s video guides you through this process and explains the steps you need to take. He also shows you how to load the example ‘sketch’ (script) to get an LED (included) blinking to test that the board is working correctly. The Blink sketch in action – it’s ALIVE! Here’s the slightly frustrating bit. Despite everything I’ve picked up during my time with the Raspberry Pi, I now need to learn how to code with Arduino to get some good use out of this board. There’s no avoiding that part – the more you learn, the more interesting your RasPio Duino projects can become. Much like the Raspberry Pi, there are loads of blogs, sites, books and other resources on coding with the Arduino, so it shouldn’t take long to start picking up snippets of information to use with this board. The initial starter ‘Blink’ sketch is great to kick off with, but I wanted to get my RasPiO Duino doing something that the Pi couldn’t. 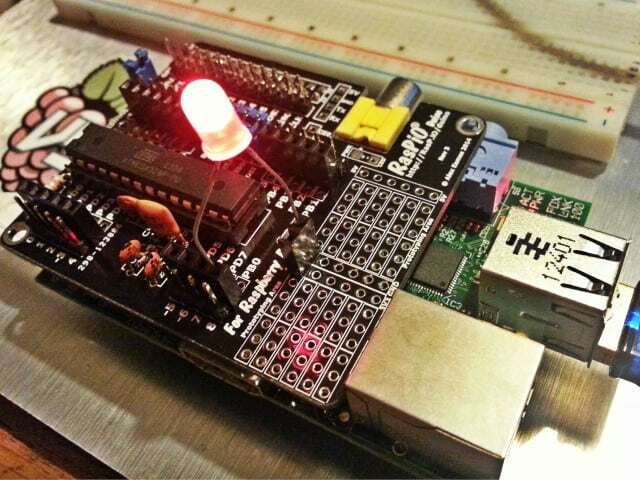 I did a quick Google for ‘Arduino pulsing LED’ and found a good article by SparkFun showing you how to do it – with example code. I’ve had a lot of fun playing with this board this evening. From soldering to using the IDE to getting that first LED blinking, it’s been a great learning experience so far with a lot more to go. I think that’s almost my summary for this board – an excellent learning tool. I’ve put off the whole Arduino thing for far too long, but this clever add-on has started me off on my ‘Ard-venture’ into a whole new coding language and micro-computer. 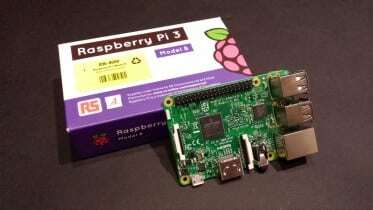 I’m getting the same buzz as when I received my first Raspberry Pi! If you’re after one for yourself, I’m sure you won’t have to wait too long. As far as I know, Alex is finishing up his huge HDMIPi Kickstarter campaign, then moving on to releasing his other designs such as this board. 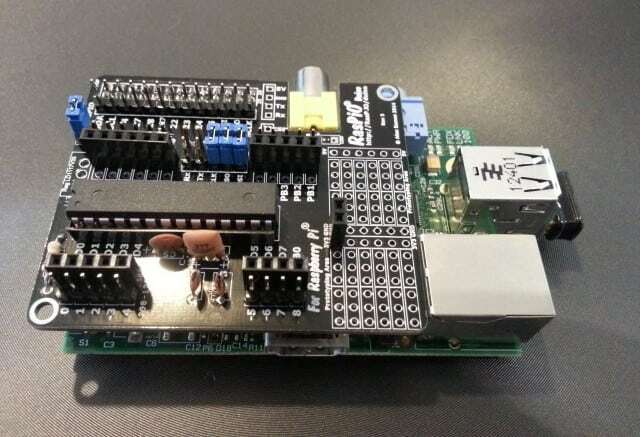 Be the first to comment on "A Raspberry Pi Arduino Add-On Board – The RasPiO Duino"